Taking an incredibly long and dangerous journey is for most people, something to daydream about. Hiking through wild jungles, trying to communicate with unfriendly natives and avoiding crippling diseases is not an endeavor to be taken lightly. To plan it three or four months before your wedding is insanity. But that’s when it started. Julian Smith, travel writer and book author, figured it was the only time he’d be able to retrace the steps of the great adventurer Ewart Grogan, who, a century before, over a two-year period, hiked the entire continent of Africa, south to north…about 4,500 miles. 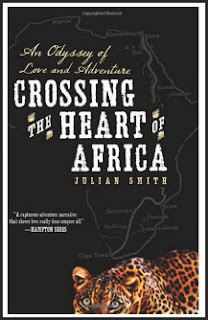 In the book “Crossing the Heart of Africa,” Julian Smith weaves two tales into one captivating book…a “twofer” if you will. Two tales of adventure for the price of one. But, you wouldn’t expect them to be two love stories, which indeed they both were. Grogan needed to prove his love for a woman in higher social standing than himself, so he set out to impress her step-father and ultimately win her hand in marriage. Our modern day hero, Julian Smith, needed to prove to himself more than anyone else, that he was ready to make that lifelong commitment to the woman of his dreams and proposed this journey as a test of his resolve. As the reader follows along, both Grogan’s journey and Smith’s journey are entwined and unwrapped, country by country as they both get closer to their northern goal of reaching Cairo. Grogan’s journey on foot and by boat was a series of mishap after mishap as his porters, guides and gun handlers would disappear and mutiny at all the wrong times. Julian Smith on the other hand, traveled extremely light and agile, via bike, bus, motorcycle and ferry. His heavy load was uncertainty…uncertain that a life-long commitment was in both their best interests. “Crossing the Heart of Africa” is an easy read with a couple captivating characters, sure to hold your interest. It is the perfect antidote to cabin fever here in the dreary winter months in Cleveland.